All weekend, our thoughts and conversations seemed to be mostly about saunas, Finnish saunas of all kinds, and Finnish men in saunas, all because of seeing a memorable and moving documentary film that drew on the full gamut of emotions from laughter to tears. Steam of Life was presented by DOXA at the Kay Meek Centre in West Vancouver this past Friday evening. Finnish men don’t usually open up about much, it’s generally thought, as they don’t like to speak about feelings. But in the sauna, it’s different. Intimacies are revealed in its soft steam, by men who sit there quietly and give voice to the sorrows of their lives. In Miesten vuoro / Steam of Life, a full-length documentary film by two directors, Joonas Berghäll and Mika Hotakainen which premiered in March 2010, Finnish men both talk and weep. – The Naked Truth, Books from Finland. Personally, I was very moved by just hearing the Finnish language itself (now that I rarely hear it) and seeing some familiar and beautiful scenes of the country, and of course the whole culture of the sauna, especially followed by swims in the lake when possible. The genuine deep emotions expressed by the men to each other in the quietness of the sauna were a revelation and sometimes moved all three of us (husband, youngest daughter and I) to near tears. After the film, the DOXA folks set up a Skype video chat with Mika Hotakainen, one of the directors. He appeared on the big screen at 6:30 am Finland time, and though sleepy-eyed, he cheerfully and with infectious charm answered many interesting questions from the audience. One was about how the camera fared in the heat of the sauna: the camera had to be warmed for about an hour and a half along with the heating of the sauna (up to 180 F!) and the use of the zoom lens had to be avoided! All the characters in the film are non-actors and spoke of real events and feelings in their lives. The shooting of each scene was usually done just once to maintain the authenticity of a documentary. The filming was done all over Finland and even Lapland. One lady asked (in Finnish, yay!) about what strange language was spoken in a certain scene – it was Saame. It was acknowledged by the director and many in the audience that taking the sauna can be a spiritual experience. We really enjoyed this part of the program as much as we enjoyed the film. We highly recommend seeing this if you get the opportunity, or get the DVD (not sure if it’s available in North America yet). It’s certainly been widely shown and highly acclaimed. Here is a good trailer at the official Finnish website, though only in Finnish. And here’s a local review by Katherine Monk for The Vancouver Sun (link since expired and removed). 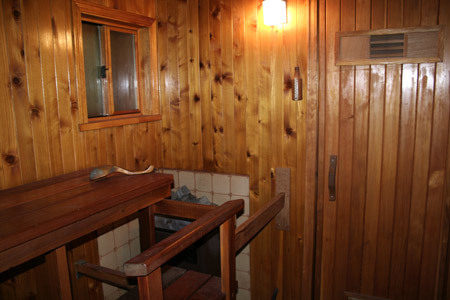 Finally, you may be interested in my popular post about saunas from a few years ago. The photo above is a reposting from that article. Oh, and by the way, sauna is pronounced sow-nah, I’m a bit picky about that. What a wonderful treat to read about saunas. And will certainly watch the movie. We had many sauna days in Switzerland, and it’s really true. There is not much to hide in a sauna, and people are more honest when it’s hot and they are wearing nothing. I can’t stand saunas in Seattle, where people wear bathing suits. What’s the point of that? Hattie, so saunas are popular in Switzerland ?! The only public saunas I’ve been to are at the pool where it’s mixed entry and everyone must stay in their swimwear, not that I’d want it otherwise in that situation. I stopped going there after my swims when throwing water on the rocks became forbidden – that’s not a sauna! You might be inspired to build your own sauna after seeing this film! Elisa, I have the same great memories and still miss that place – it was the best sauna experience! Welcome to our city one, minus the dock and river. I wonder what J would think of the film? Fascinating. There is a phrase in Japanese that literally mean “skin talk” and that describes the kind of conversation that results when folks are soaking in the hot spring together. That culture has also been described as closed and reticent by others. But sit in the hot spring with somebody, and a whole new world opens up. I’ll definitely check into finding the DVD here. Kiitos, Marja-Leena! I went over and looked at the trailer. It looks to be a very fascinating movie and we’ll surely put it on our list. Rouschswalwe, I’ve heard those things about the Japanese, thanks for reminding me in this context! Let me know where you find the DVD and what you think of the film after you see it. The host replied that there wasn’t one in the Kremlin. “Well, where do you people make decisions, then?” the diplomat asked, incredulous.